Eco-A’s event at Emory University on Tuesday April 25, 2017, served as a focal point for educating about the nature of the special forest found in metro-area of Atlanta. Videos of the entire evening’s proceeding are available now on Youtube. 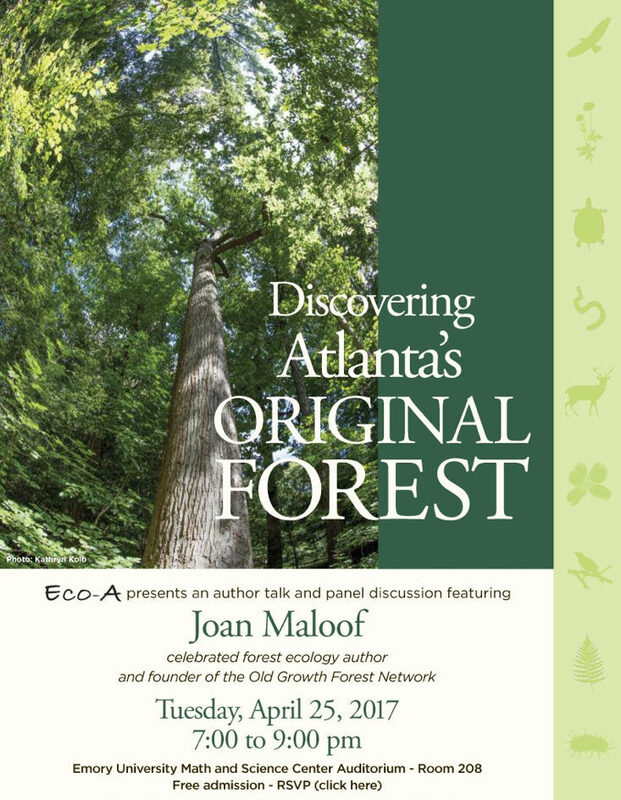 April 25, 2017 – Joan Maloof shares the science behind the special values of Old Growth Forests after a welcome by Betty Willis, Senior Vice President for Government and Community Affairs, Emory University for the 300+, standing-room-only audience. April 25, 2017 – Debra Pearson, retired 30-year Atlanta class-room educator, describes a life-changing forest event in her back yard. Kathryn Kolb, Director EcoAddendum, shows the history and value of the unusual forest of the City of Atlanta and its greater-metropolitan area. April 25, 2017 – Tim Keane, City of Atlanta Director of Community Development shares remarks, then Maria Saporta (at far right) leads Atlanta community greenspace panel discussion, and 15 Atlanta greenspaces are inducted into the Old Growth Forest Network. Panelists, l-r: Joan Maloof, Founder, Old Growth Forest Network; Prof. John Wegner, Dept. of Environmental Science; Emory University, Mario Cambardella, City of Atlanta Director or Urban Agriculture, Darryl Haddock, Education Director, West Atlanta Watershed Alliance, Dr. Jacqueline Echols, President, South River Watershed Alliance. To read attendees comments and questions about Atlanta’s urban forest and tree canopy click here. What a night! Over 300 people showed up for Discovering Atlanta’s Original Forest, a celebration of Atlanta’s old growth forests, hosted by non-profit EcoAddendum (Eco-A for short) at Emory University. The event was designed to raise awareness about the special nature of Atlanta’s urban forest which includes–who knew?– pockets of old growth and original remnants from the heart of the city to most corners of the metro area. Informative presentations were followed by a panel discussion and an induction ceremony, where 15 Atlanta area forests were inducted into the national Old Growth Forest Network. See below for a photo of all the inductees with names of the forests and those representing them. Please feel free to copy and share as needed. Betty Willis, Senior Associate Vice President for Government and Community Affairs, began the program with a warm welcome from Emory University. Keynote speaker Joan Maloof, founder of the national Old Growth Forest Network, spoke eloquently about the unique aspects of old growth forests that nurture significantly more species than disturbed forests. Surprisingly, even forests that are re-established over time cannot provide the higher degree of biodiversity found in undisturbed forests. Much of this is due to complex associations of small, sometimes microscopic, yet extraordinarily important species such as extensive networks of mycorrhizal fungi that connect trees with nutrients they could not otherwise access. Additionally, these fungal networks connect trees to each other, creating a “wood-wide web” of communication and resource sharing between trees, even of different species. Eco-A Board Member Debra Pearson, a 30-year classroom educator in Atlanta Public Schools, introduced Eco-A and and told a moving personal story of her experience turning a neighbor’s destructive tree cutting incident into an opportunity to create a nature preserve in her own back yard in College Park. Eco-A Director, Kathryn Kolb, showed how unusual accidents of history gave Atlanta its special forest, and showed how to identify these remnants of original and old growth forests in our neighborhoods, illustrating her talk with beautiful photographs of Atlanta forests and trees. Atlanta’s Commissioner of Planning and Community Development, Tim Keane, explained new proposals that aim to create an overall assessment and master plan for protecting Atlanta’s urban forest. a need to educate the city’s leadership about the necessity of preserving this unusual resource. change attitudes toward development so a forested area is not seen as “empty” and, therefore, a preferred site for development. identify forests that should be preserved and advocate for city investment in them. Additionally, the audience had the opportunity to voice their concerns and offer suggestions on protecting Atlanta’s trees. Eco-A will compile all written comments to be shared with the Atlanta Office of Sustainability, the media and Atlanta’s growing community of tree advocates. Many expressed frustration at the accelerated tree and canopy loss of recent years, but many also expressed optimism that by educating decision-makers, mechanisms can be developed that include saving more high value trees and forests as part of the development process. Solutions discussed include new urban planning and design, and creating more effective tree ordinances so communities no longer have to choose between trees and new development. The good news is Atlanta has more tree canopy than any other major city in the United States. The challenge is how to conserve what we still have left. In addition to 13 public forests, two private forests were also inducted. In both of these forests, property owners removed large quantities of English ivy and other invasive species without using any chemical treatments to restore the healthy native biodiversity of their forest, protecting their rich nurturing soils. Listed below are the forest inductees and those accepting certificates of recognition. A permanent sign with the Old Growth Forest Network emblem will also be provided to each forest. Property managers will be encouraged to collaborate, get to know each other’s properties and consider their combined green spaces as one powerful asset.